Paddy Doyle takes a rest at Blue Spring State Park. 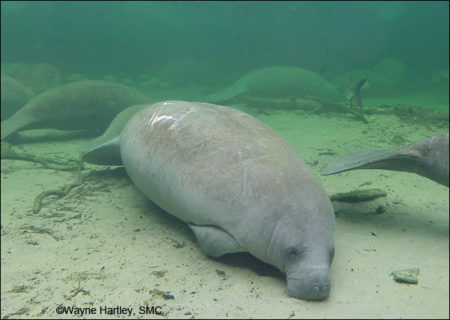 Paddy Doyle was named at the request of a visiting researcher, who was Irish and thought it would be nice to have an “Irish” manatee at Blue Spring. It turns out that Paddy’s “fighting Irishman” name is quite appropriate. During three different winter seasons, researchers selected him to be monitored by the manatee tracking program. Each time Paddy had to be captured to be fitted for his equipment, his feisty nature was evident. However, researchers managed to tag him despite his resistance. Paddy returns regularly to Blue Spring each winter and makes a number of showings at “roll call” each winter, when researchers travel the spring run in a canoe and count the manatees present. In fact, Paddy likes the area so much he has been known to stop by during the summer months as he cruises around the St. Johns River. Paddy Doyle is available for adoption, and each person who adopts him will receive a full-color photo, biography, and adoption certificate, as well as a membership handbook and subscription to The Manatee Zone, a newsletter featuring updates on the adopted manatees when they are sighted, and Paddle Tales, Save the Manatee Club’s bi-monthly eNewsletter. For more information about adopting Paddy, go to Save the Manatee Club’s Adopt-A-Manatee page, or call 1-800-432-JOIN (5646). And be sure to watch for Paddy Doyle and other manatees on the Blue Spring webcams at ManaTV.org and read updates from Manatee Specialist Wayne Hartley. Watch video footage of Paddy Doyle the manatee at Blue Spring State Park.